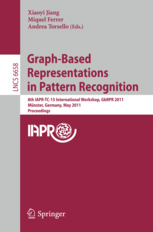 GbR is a biennial workshop organised by the 15th Technical Committee of IAPR, which aims to encourage research works in Pattern Recognition and Image Analysis within the graph theory framework. This eighth workshop will provide a forum for presenting and discussing research results and applications in the intersection of pattern recognition and image analysis on one side and graph theory on the other side. A selection of pictures from the workshop can be downloaded (zip file, about 17MB). These pictures have been reduced to a smaller resolution which is sufficient for most purposes. If you do want to have the original resolution ones, please contact our GbR2011 cameraman directly. The report about the discussions made during the Challenge Session. Many thanks to Nicole Artner for this nice work! The proceedings of this workshop appear as LNCS Volume 6658 , which can be accessed online.